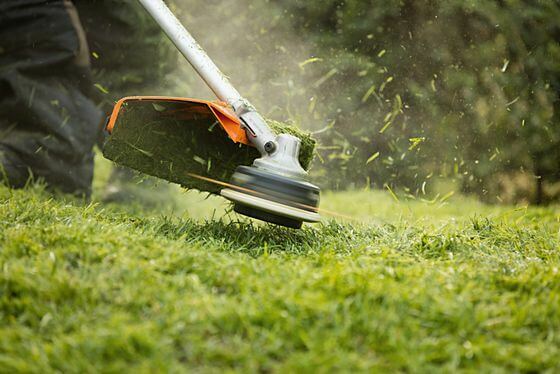 We often get asked the question “What is the difference between a grass trimmer and brushcutter?” The simple answer is that you can run a selection of blades and attachments for a variety of different uses on a brushcutter, whereas you can’t on grass trimmer. STIHL brushcutters feature a gearbox and the drive shaft is straight, so that more torque and power can reach the cutting attachment. 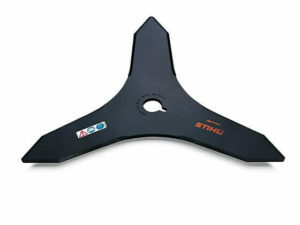 STIHL grass trimmers have a bent shaft and do not feature a gearbox. 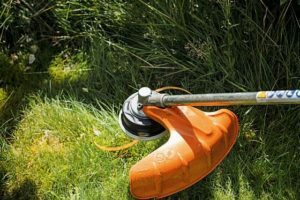 They are great for mowing grass and light weeds around the garden, but aren’t the right tool if you need to tackle larger areas or heavier growth. How thick and dense is the vegetation? Is the area safe to access? 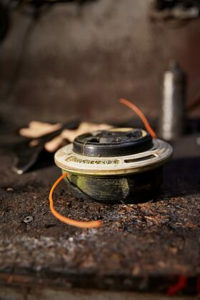 Are there any potentially dangerous objects within the area, such as wire, rocks, and raised ironworks? If the area isn’t safely accessible or there may be potentially dangerous objects lying around, we recommend you ask a professional for advice. But if the area is easy and safe to reach, now is the time to choose your cutting attachment for your brushcutter or clearing saw. This handy guide will help you decide which one is best for the job, but before using any tools and attachments, don’t forget to read the owner’s manual too. Are there obstacles in the way? For mowing grass around obstacles, such as trees, and along lawn edges we would recommend a mowing line head. 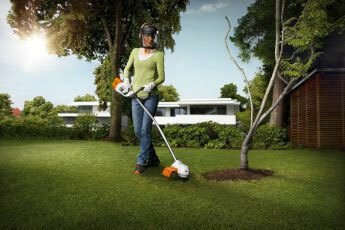 Our most popular line head for our brushcutters and grass trimmers is the STIHL AutoCut head. 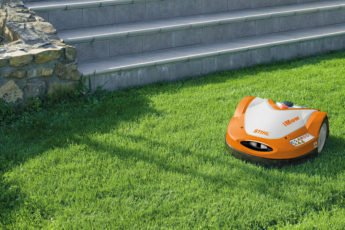 The AutoCut is simple to feed and the ‘bump head’ means that the mowing line can be automatically fed out by bumping it on the ground – there is no need to manually adjust the line by hand, keeping things clean and simple. Mowing line gives a neat finish to the grass and when trimming around obstacles, it allows for more control and freedom. Just be mindful that when mowing against hard surfaces, along fences and around trees you leave enough distance so as not to cause any marks or damage. Mowing too close to obstacles can cause the line to break too – if you find that the line is breaking too easily, then pop it in some water over night and it will become more flexible. Are you cutting light vegetation? This can be anything from dense grass to weeds and stinging nettles. Mowing heads that can run thicker line will cope with the majority of grass and weeds, however you may find that you end up going through more line than necessary. If the mowing line isn’t quite cutting it, then it is definitely worth considering either a STIHL PolyCut or DuroCut head for your bruschcutter or grass trimmer. 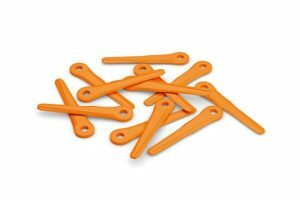 The PolyCut head is made up of three replaceable polymer blades that are designed to work in a similar way to a metal grass blade, but with a much higher level of flexibility, especially if there are any obstacles present. The DuroCut heads run serrated line pieces up to 4mm thick that are easy to replace and ideal for cutting through taller vegetation such as nettles and even some more woodier species. 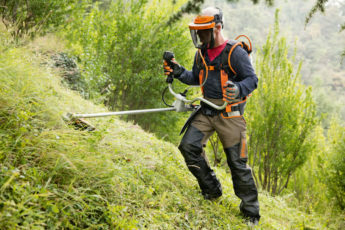 Are you cutting heavy vegetation? Once you get into the realms of dense grass tussocks, paddock management and areas that feature a large concentration of weeds, it is worth thinking about metal grass cutting blades. These are available in two, four and multiple tooth varieties. The more popular styles are the two and four toothed blades as they are well designed to cope with a variety of green, heavy vegetation. The sharp edges allow the thicker stems to be cut instead of bludgeoned, giving a neat and much quicker finish to the job. Blades also tend to vibrate less, so for long term use, they are often the most comfortable option. Always be aware that the blades may kick out if they come into contact with a static object so be careful when mowing around obstacles. Also, always make sure that the cutting tool is correctly fitted. 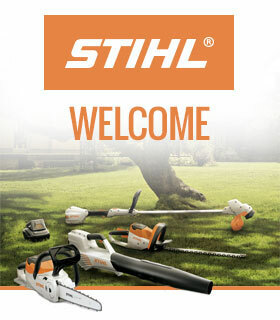 If you aren’t sure then it’s best to ask for advice from your local STIHL supplier. Do you need to tackle woody shrubs, reeds, brambles and bushes? When thinning out and clearing areas of thick, woody vegetation it is time to consider a more substantial cutting tool. Brush knifes and shredder blades are the ideal choice for tackling tough, thick and gnarly growth. Both the three bladed brush knife and the shredder blade are designed to be used in more of an up and down motion, working from the waist downwards, removing the vegetation in stages. The advantage of this is that it helps mulch the material, reducing its overall size. This method of cutting also works well when cutting brambles as the blade is much less likely to get tangled up. Are you cutting bushes and thin trees? Traditionally, we always tend to think of using a chainsaw to cut thicker bushes and thin trees, however the right cutting tool on a brushcutter or clearing saw can be just as effective. The chisel tooth, scratcher tooth and carbide tipped saw blades work in a similar way to a circular saw, just in a horizontal action instead of vertical. When cutting small, thin trees or bushes it allows you to cut close to the base without having to bend down so there are a great option for thinning out work on plantations and large areas of mixed scrub. What brushcutter or grass trimmer cutting attachments have you used? Which ones do you prefer? Let us know in the comments below.